Ever tried the famous Hainanese Chicken Rice? I’m not quite sure if this popular dish was originated from Singapore or Malaysia. Some friends told me that it was from Singapore. Is it right? No matter you go into a Singaporean or Malaysian restaurant, they would definitely offer this dish on their menu, not very expensive and worth trying if you didn’t. The chicken meat is very smooth and tender, going so wonderful with the unique chili sauce. I can’t describe how yummy is the rice. It’s not ordinary white rice, but is cooked with chicken broth. So you can imagine that’s a luxury treat when you order Hainanese chicken rice with not-so-expensive price, enjoying a dish with rich flavours. However, it’s quite disappointed when I go into some restaurants that only offer salty and oily rice instead of the premium rice cooked with chicken broth. When it comes to cookIng this dish, there’s a traditional way of using the whole chicken. Due to my family’s craving for chicken legs, I simply used chicken legs so that I saved more of my energy and time for cooking. That’s good to me and my family. Heat oil in wok, sauté minced garlic and grated ginger until aromatic. Be cautious, don’t let them burn. Or else your rice would turn brown when cooked. Add drained rice and stir fry for 3 minutes. Toss in bay leaves and pour chicken stock into the rice. Bring to a boil. Transfer to electric cooker and cook rice as usual. Rinse chicken and drain well. Place spring onion and ginger on chicken and steam over high heat, covered with a lid, for about 20 minutes, or until cooked through. Insert a chop stick or needle into the thickest part of chicken leg. If clear liquid runs out, it’s cooked. Immediately transfer chicken legs into iced water and soak for 15 to 20 minutes. This is an old traditional Chinese way of making the skin and meat of steamed chicken become smoother and tenderer. To prepare chili sauce, just process all ingredients with a food processor for a minute. Add salt and/or sugar to taste. When the chicken legs cool down, drain well. Chop into chunks and serve with cooked chicken rice. Garnish with cucumber slices if desired. Many Chinese people like eating steamed chicken with minced ginger and spring onion sauce. Just heat up a bit oil in wok or saucepan. When the oil becomes very hot, immediately pour the oil onto minced ginger and finely chopped shallot. Add salt or soy sauce to taste. That’s the popular ginger and shallot sauce for chicken. This Hainanese chicken tastes fantastic, accompanying with both chili sauce and minced ginger shallot sauce. mmmmmmmm...that sounds really good. i never tried this before. so the chicken is supposed to be served cool and not hot.. interesting! Yeah, the chicken would not be hot when served. As the steamed chicken is very very hot, after soaking in iced water for a while, not too long, the temperature of chicken would decrease to around room temperature. Looks really good! I can never get the skin to be like that. this recipe is very good.thanx u for the recipe. When I was in Singapore, this was the must try dish, and it was so popular, and after trying it, I can certainly see why. This dish will make you "love it by the first try", wonderful. The dish comes from Hainan Island just off the coast of China. Great Recipe. I'm going to try this recipe tonight! I'll let you know how it turns out! I had to double the ingredients as I was making it for four and the chicken was awesome!! It was soooo smooth and I only used normal chicken. Will try to use corn-fed chicken next time, I bet it will be even smoother!! The rice was delicious! Wow, it's great to hear your good news! If you use organic chicken, it would definitely more delicious. And definitely did link you back! Thank you for the recipe and keep them coming in! Thanks for your link love. I can't have Hainanese Chicken rice without the yummy dipping sauce. The sauce is a must. And thanks for visiting my site too! According to my friend who is Chinese-Indonesian. In Hainan island itself this chicken rice is not well known. Hainan Island is the smallest province of the People's Republic of China, located off the southern coast of the country, almost closed to Vietnam. 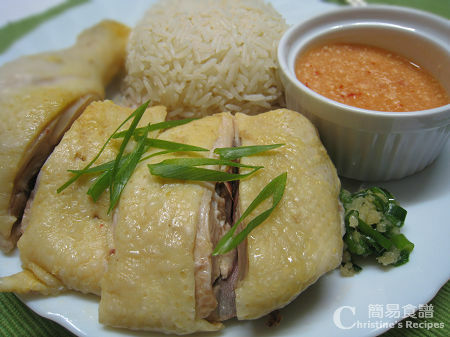 Hainanese Chicken Rice is so well known in South-East Asian region such as Indonesia, Malaysia and Singapore. It is a very good idea to include pictures in your method of cooking as they make your instructions to follow easier and clearer. They do help a lot for a novice cook like me. I will try your recipes as they look delicious and easy to follow. This recipe if great, I love Hainan Chicken rice! I'm a bit confused to "shallot / spring onion" ... do you mean the traditional shallot or green onions? The shallot and green onion are two different foods. If you google them, you'll know. Click to read about shallot and green onion here. The dish is first prepared by Hainanese immigrants from Hainan Island post WWII in Singapore, so it's a Singaporean dish. As its name says , the recipe originated from Hainan Island China . I visited the Island and lived with the relative in the village last year. this is a popular dish there , therefore it was not true to say that it was created anywhere else .this is a popular dish in any Hainanes home ( Malaysia or Singapore ) the original recipe never called to put chinken in the ice water , but it is not a bad idea as the ice water will stop the cooking process and therefore keep the meat tender. Just want to make clear that this great recipe belongs to the Hainanes from its mother land, not Singapore not Malaysia or anywhere else. My friend who went to Hainan Island says that chicken rice there tastes quite different from Singapore/M'sia's version. Anyway regardless of the origin of this dish, I tried this recipe today and it's really yummy. And I seldom cook! I prefer more garlic and ginger in the recipe though. Thanks! For steaming the chicken, do you submerge it in water? or how do you steam it? I placed the chicken on a staker in wok above boiling water, then cover and steam. 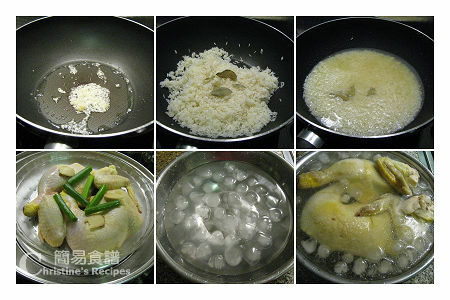 If you want the chicken skin smoother, you might soak the steamed chicken in cold water straight away after it cooked. 1) According to my friend who is Chinese-Indonesian. In Hainan island itself this chicken rice is not well known. 2) Just want to make clear that this great recipe belongs to the Hainanes from its mother land, not Singapore not Malaysia or anywhere else. 3) My friend who went to Hainan Island says that chicken rice there tastes quite different from Singapore/M'sia's version. I have made a couple of comments before, but this time I am going to get a proper perspective on this so called Hainese Chicken. I have made a total of 3 trips, the last two within a span of less than a week about 2 seeks ago, trying to get to the bottom of this mystic origin of Hainanese chicken. I am making one very soon, in a matter of weeks. To get to the true Hainanese way of doing chicken. The first trip, I tried to look for the so called Hainanese chicken rice (in Chinese characters of course) in any restaurant in Hainan. I did not find any. They simply called it chicken rice. I heard so many stories about this from taxi drivers and ordinary folks alike. In fact after I surfed the web, the ancestry home of most Sinaporean and Malaysian Hainanese is in fact more than 90% of them from Wenchang. In Hainan, most people believe the Wencheng version is the most popular. So I can see so many shops displaying Wenchang Chicken, even in other cities in China trying to emulate the Wenchang Chicken. You know where is the best place for Hainan chicken, of all places, Hong Kong, HK Island, not Kowloon. This is my opinion. - no blood on the dish and the meat is just cooked. and it is entirely up to you to make up the right concoction you desire. I think this is new for me. corn grits or other organic feeds found on the field. The epicentre of this Wenchang chicken is called Tan Niu Zhen, (mud-pool, cow town) Google map it. So I think this perspective has a little more meat to it. figuratively and literally, why I have tasted many times in Hainan and alot more places in the world than you could imagine. Hey, great recipe! I used peanut and sesame oil liberally and thought it was closer to the original flavor! Hi Christine! My mum made her Hainan Chicken Rice Recipe! It is sooo good! Yours look absolutely delicious! My mum has a different sauce though? Is there any background about that? Hainan chicken rice is from Malaysia. You can find the original version in a state called Melaka. It's very famous. I've asked my friend from China and have personally been to hainan so I am pretty sure of this fact. Damn the singaporeans. They even claim that penang char kuey grow is from Singapore, what more can I say. Sorry bout the rant. Excellent recipe! I am Thai born Hinam (Hinan I think it's Mandarin) and I only understand and speak a little of Hinam (39 yrs in USA). We call ourselves Hinamnang, chicken and rice we call Goiy-Buiy. In Thailand we call Chicken fat rice, because you suppose to cook the rice with chicken fat(yes very healthy)and the chicken suppose to be sterile rooster to make them fat (yes), then you use the broth to cook rice so your rice taste better than plain cook rice and sauce accompany the chicken. Goiy-Buiy is the simplest and easiest food to cook and very popular in Thailand and dose not come from Malaysia or Singapore or anywhere else, may be alter to favor locale taste like Thailand. In Singapore they made it look better with presentation of the arrangement of different condiments but taste wise I don't think you can beat Thailand. Why, because of the sauce. Thai version is ginger, garlic, chili, ferment soy bean (residue from making soy sauce), vinegar and thin sweet black soy sauce. By the way my dad do this for a living when he first come to Thailand during WWII and he'd never been gone to Malaysia and he sterile chicken himself I still have his tools back in Thailand. How to cook chicken when the water boil stuff chicken with couple of tb spoon rock salt in side chicken, drop the chicken, put the cover back and do not open for 40-45 minutes, take the chicken out if you want to drop in ice, fine but you don't need to (got this from famous Chinese BBQ place). I've seen recipes where the chicken is boiled and the broth is used to cook the rice. Your recipe calls for steaming the chicken, which is used in many recipes. I favour steaming as opposed to boiling, as much of the flavour gets washed away with the broth. hi there, may i know how do you make the cicj=ken stock? thanks. Do you mean chicken stock? Use whole chicken, I often use chicken frames,and cook with some veggies to make soup. Or get some ready-made soup from supermarkets. Here is the sequel. I made another 3 trips to Hainan and now I am sure there is NO way the Singapore nor Malaysian can come close to the Tan Niu Zhen version. My stay is a month at a time. On a closer encounter, I took a lot of pictures from every nook and cranny of Haikou city and other township as well, number no less than 10. Singapore and Malaysian are all fake versions. The taste of the Hainan Chicken in Singapore and Malaysia speak volumes about its origin. In one shop, when I ordered a small portion to taste, the moment the chopper meets the chicken, I can smell fragrance of the chicken meat permeates throughout the restaurant, that is how good it is. On my last trip, on my way home on a plane, there are more than 4 passengers from Hainan on the same plane with me. They did not know how to fill in their immigration card so I helped them all. Later they told me that each of them carry 20 chickens at the request of their friends and relatives in Singapore, there you go. Case close. One said he did it several times before and he said, there is no problem with custom for chicken, much to my surprise. Usually meat are not allowed to be carried into a country this way. Definitely not in Canada or the US. NO way Jose. Further to this, I was told by another passenger that, there is a chicken shop in Sanya which sells cooked chicken and a lot of overseas Chinese mostly from Singapore who bought 10 at each time to be brought home just before they board the plane to maintain the freshness as much as possible. Another solid evidence that Hainan chicken recipe is from Singapore is a hoax. Those chickens are not cheap about 150 -200 RMB a piece. If the recipe is from Singapore why do you think people want to go to Hainan to get it. The fake version is usually of inferior quality. THIS SHOULD PUT THIS MYTH TO REST ONCE AND FOR ALL.